Marco Fu pulled off an upset on day two of the Dafabet Masters at Alexandra Palace, twice coming from a frame behind to send home Judd Trump 6-5 in a thrilling encounter. After a positive start to the season which saw Marco Fu win the Australian Open and reach the final of the International Championship, he has struggled to find any form and even lost in the first round of the UK Championship to amateur Mitchell Travis. Today in his first round match at the Dafabet Masters in Alexandra Palace, he was pitted against another player looking to regain some form after a dreadful start to the season, Judd Trump. The match begun slowly between the usually high scoring pair, the only highlight being former UK Champion Trump's run of 87 in the third frame, as they went 2-2 at the mid-session interval. When they resumed it was 2011 Masters finalist Fu who took full advantage, making a smooth break of 138, the highest of the tournament so far, to take a one frame lead once again. 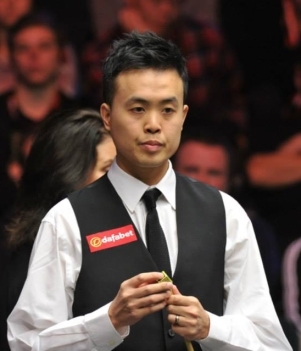 Marco Fu recorded the tournament high break of 138 in the fifth frame. 'Ace in the Pack' Trump won the next two frames with a top break of 120, before Fu hit back himself by winning the next two, scrappier frames to take a commanding 5-4 lead in this best-of-11 match. Former world no.1 Trump wasn't to go down without a fight and he produced runs of 30 and 101 to take the match deservedly into a decider. Trump was in amongst the balls and lead 12-0 before missing a black and left Fu in to make the classy break of 78 to seal victory, 6-5. No doubt Trump will be disappointed with how his season is going, not making it past the last 16 of any major tournament so far, and will be looking to find some confidence heading in to the German Masters in two weeks. 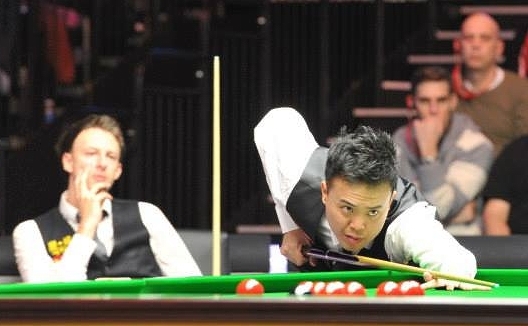 Fu on the other hand, after his slip up at the UK Championship, will be delighted with how he held himself together in this match, especially after missing the last two previous Masters events. He plays the winner of Ding Junhui or Shaun Murphy on Thursday afternoon.